Following on from OBERTO’s 2014 conference, which challenged stereotypes of elitism in opera, this September another enthusiastic and diverse group of scholars, students and opera industry professionals, gathered at Oxford Brookes’ Headington Campus to explore a wide range of historical angles on the changing nature of celebrity in opera, with papers ranging from eighteenth-century Parma to contemporary use of digital and social media. 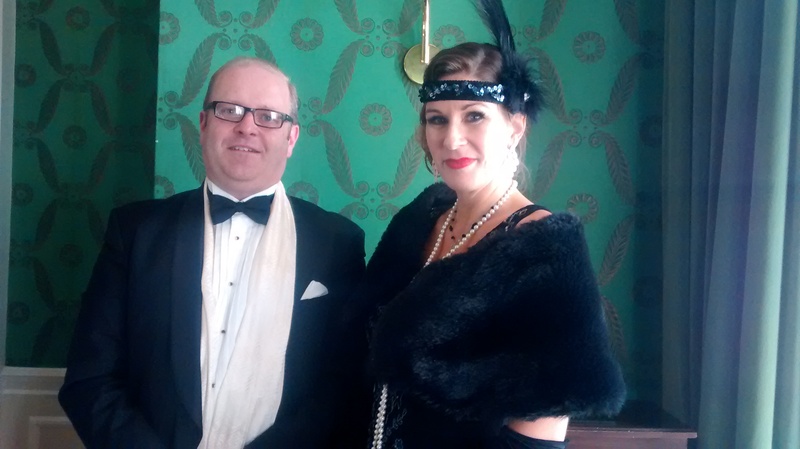 Samantha Hay and Luke Green recreating a 1920s celebrity recital. In the opening session, David Kennerley (University of Oxford) and Anna Maria Barry (Oxford Brookes) presented complementary examples of female and male singers as objects and agents of celebrity in the nineteenth century. Kennerley’s examination of two prima donnas in London, Catley and Vestris, highlighted their own manipulation of an exaggerated morally questionable public persona and how that might contrast with the reality of their private life. His paper also pointed to contemporary critical distinction of ‘effeminate’ celebrity culture from more serious and implicitly masculine musical criticism. Barry used three examples of male singers, Santley, Kelly and Reeves, to show how the masculine celebrity image could be shaped to portray a rugged, physically active persona. She also highlighted the way in which a vigorous contemporary conversation between different accounts and through the correspondence pages developed. Finally, she pointed to some of the consumer material culture through which the celebrity was connected to the public, including portraits of famous singers that were sold to be tinselled by young boys. During the first of two parallel sessions, Margaret Butler (University of Florida) and Christina Paine (Royal Holloway) presented two in-depth case studies of prima donnas’ influence and power – Caterina Gabrielli in 1760s Parma and Angelica Catalani in Regency London. Butler focused on new evidence from her archival research of theatre accounts demonstrating a singer’s influence from an institutional perspective. Gabrielli’s celebrity enabled the Parma theatre to pay down debts incurred through expensive French stagings and ballets. Paine examined how Catalani dealt with crises of her own ‘celebrity’ during two notorious episodes, and considered ways of challenginggender stereotypes about women’s agency, particularly with regard to their legal status and political power. In the other morning panel, IngeborgZechner (University of Salzburg) and Clair Rowden (Cardiff University) gave papers on two Scandinavian prima donnas, Jenny Lind and Christine Nilsson. Zechner analysed the role of the media and managerial marketing strategies and the interplay between the London opera theatres, the wider celebrity market and lucrative US concert circuit. Rowden built on the theme of the development of the international celebrity opera circuit, and showed how Nilsson’s marketed persona highlighted and perhaps exaggerated elements of religion, Scandinavian and Nordic culture enthusiastically played on by the media. Finally, Annabelle Lee fast-forwarded us to Joyce DiDonato’s use of social media, which gave the Twitter users among the audience the chance to live tweet responses to her thoughts about tweeting! Lee presented rich data from interviews with social media followers of DiDonato. The ‘graveyard’ slot after lunch was enlivened by a round-table of industry professionals, Michael Volpe (Opera Holland Park), Hugo Shirley (Gramophone) and Rupert Christiansen (Daily Telegraph). The panel dissected various contemporary afflictions facing contemporary operatic celebrity culture. They questioned the augmented role of the stage director, over-training of singers and a homogeneity of sound and personality, and the influence of visual and digital media. The final panel session of the day on ‘Mechanics of Celebrity’ comprised papers on less conventional operatic products, by Colleen Renihan (Mount Allison University), Anastasia Belina-Johnson (Royal College of Music) and Derek Scott (University of Leeds), and Harry Hickman (University of Cambridge). Renihan stunned the audience with a You-Tube video of child star Jackie Evancho and examined the ways in which opera is used in the repertoire of child stars in the United States. Belina-Johnson and Scott analysed a selection of Polish operetta celebrities from the early twentieth century including how the operetta system was embedded in the wider commercial culture of Poland. Finally, Hickman pursued the theme of the relationship between new media and live performance by analysing the creation of the Metropolitan Opera’s DVD ‘Wagner’s Dream’ to accompany their Lepage Ring Cycle and how it might have influenced consumption of the performance itself both in the theatre and on DVD. Speakers travelled to the conference from as far afield as Austria, Canada and the United States. Feedback from delegates about the day was extremely positive, with one American scholar saying “The level of scholarship was high all round and the breadth of topics within the theme was also impressive….The conference was an excellent introduction to your research unit, which is sponsoring vital work for our field”. Looking forward to OBERTO 2016!